Jennifer Seay, the founder and president of Art + Artisans Consulting Inc., has had a big year. Founded in 2002, Seay’s firm offers a wide range of art consulting services to help commercial clients make decisions on the artwork they want in their building or office. Art + Artisans sources the artwork and manages its creation and installation. Over the past year, Art + Artisans won contracts for The Independent, the luxury condominium high-rise with a distinctive Jenga-like design, and the new PwC Tower in downtown Dallas. On the personal side, Seay completed a yearlong leadership program through the CREW Network, a coalition for women in commercial real estate. “It was very transformative for me. I met some incredible people,” she said. This year could be even bigger. Art + Artisans doubled its revenue last year. And, because of that growth, the 17-year-old company is doubling its East Austin office space. Seay bought more space next door to her firm's current office at 2401 E. Sixth St. when it suddenly became available. 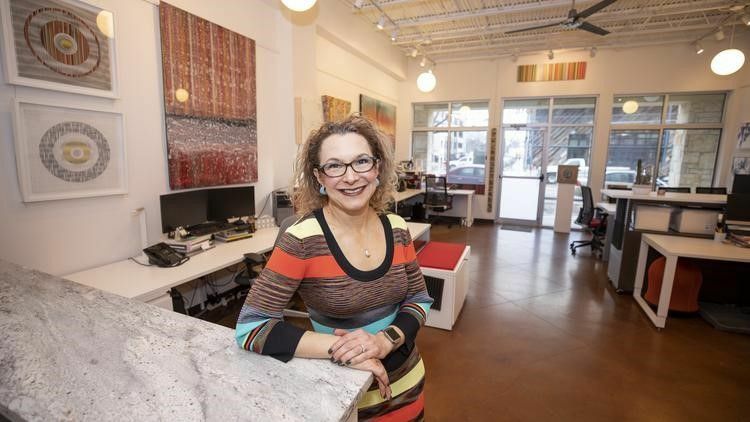 The additional space will allow Seay to continue to expand her company, add employees and bid for projects across the country — she said a part of her three-year plan for Art + Artisans is to take it national. Have you ever faced a life or death situation? Back in my early days of art consulting, I had about $20,000 worth of art in my car, and I was driving back from Houston back to Austin. We had just had the first cold front come in for the season, and the deer were very frisky. I was driving, and the guy behind me started flashing his lights. I was like, ‘Huh, why is he flashing his lights at me?’ And then, right as I had that thought there was a deer. I was going 70. The entire windshield completely shattered. That windshield saved my life. That was before cell phones. The driver behind me took me into Columbus to call my mom and a tow truck. By the time I got back to my car, someone had taken the deer. The deer was gone, but the $20,000 worth of art in my car was fine. Who is your favorite artist? Mark Rothko. I love the chapel in Houston. I just find his work very peaceful. What is the best part of your job? My team and building the team. I think it took a little time to figure out that it is really about having the right people on the team. And once you get the right people on the team it feels so good. I feel like we have so much fun together. We accomplish so much. Even when there are problems and issues, we are all together dealing with it. Everyone is super supportive. What I’ve learned in the past couple of years is that building the team and creating something is so much fun to me — creating a place where we really want to work and be. When we all really want to be here, and we are all enjoying the work, then that is what comes across to the client — and that’s when we can take really good care of the clients. It starts with the team. What’s the key to building a good team? Understanding what strengths you are looking for and being really thorough in your hiring process to make sure you are hiring the people who are the best fit for your culture. Here, we are focused on professional development, client service, work ethic and positivity, so I know there are certain things that are super important to me. If I am not getting the sense of that, it is not going to work out. What kind of boss are you? I think I’m collaborative and open. I think I’ve hired really good people, and I trust them. I don’t micromanage them, but I am here to support them and steer the ship. How do you de-stress? I go to the gym at 5 a.m. Between the kids and work it’s the only time I know I can do it without interruption. It is my ‘me’ time. It clears my head and my stress and sets me up for a great day. Practicing mediation and breathing helps me deal with whatever stress pops up during the day. What motivates you? Always trying to be my best and trying to always learn something new and stretch myself. What did you listen to on your way in to work today? I am listening to “From Good to Great,” Jim Collins’ audiobook. My time in my car is when I try to sneak in some extra reading. What’s the toughest part of starting your own business? At the time I started my business, I didn’t even think it was tough. I was just so excited about it, and I had so many ideas. You will never work harder than the first year that you start your own business. I couldn’t turn it off. There were so many things popping in my head. I would stay up to ridiculous hours. You are just constantly thinking about it. How did you earn your first dollar? My very first dollar was a newspaper route. My first job out of college — I wanted to go into sales, but nobody would hire me because I didn’t have experience. I found a job with an off-brand yellow pages. It was August. We had to go to work in a full suit and pantyhose. I was going door-to-door selling off-brand yellow pages. I still remember the first time that I sold one and I got him to upgrade to have it in red instead of black. You got a bonus if you did that. I got a check for $900-something dollars. I couldn’t believe they were paying me that much money. I did that for six weeks. Then I went and got a job in radio sales because I had experience. What is your favorite thing about Austin? The people. I have been here for 30 years. My closest friends are here. This is my home. I’ve grown up here. It just feels like home. What’s your least favorite thing about Austin? July and August.